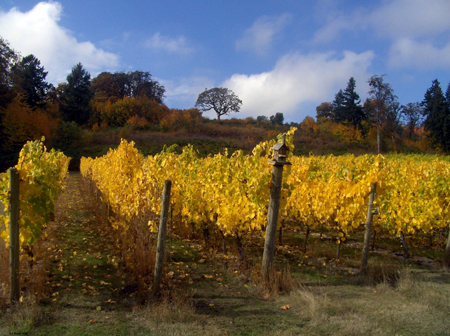 Witness Tree Vineyard is a small producer of premium quality Pinot Noir and Chardonnay made entirely from grapes grown on our 100-acre estate. As winegrowers, we believe that only by tending our own vines can we produce the finest wines. Low yields in the vineyard and minimal handling in the winery allow us to create wines of depth, elegance, concentration, and character. They are the ultimate expression of the earth from which they were born. Witness Tree Vineyard is owned by Dennis & Carolyn Devine. The Devines are originally from the Midwest, but have lived throughout the country during Dennis’ career as a clinical researcher in the pharmaceutical industry. Carolyn serves as President and Business Manager. Named for an ancient oak which towers over the vineyard – it was designated a surveyor’s landmark in 1854 – Witness Tree is dedicated to the production of exemplary estate – bottled Pinot Noir and Chardonnay. Dennis and Carolyn Devine welcome you to our tasting room.